Operation Fast and Furious: It has a few different names, but the Obama Administration took a Bush program that tracked weapons sales finding their way to Mexico and put it on steroids. Agents under Eric Holder’s “Justice Department” not just allowed, but facilitated and used Stimulus money to get weapons into the hands of drug cartels. 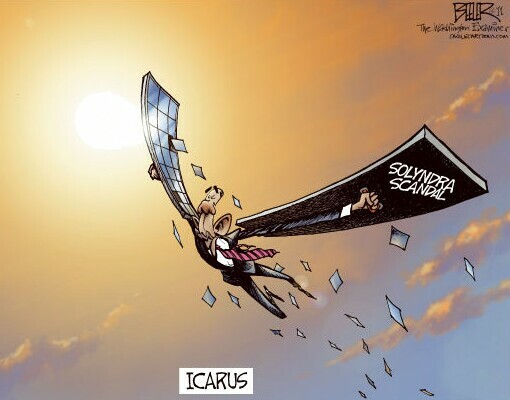 Holder has been holding out and not cooperating with Congressional inquiries. Any Republican president and most Democrat ones too would be hounded by the press, but not Obama. Japan’s Earthquake/Tsunami: We all watched the horrifying video of buildings, houses, cars, and people tossed around like toys in the wake of the earthquake and tsunami in Japan. The devastation was so great that the images almost didn’t seem real. After the initial impacts we then watched brave workers try to prevent a massive meltdown at one of their nuclear power plants. To many this prompted a call to halt the spread of nuclear energy, but it was quite remarkable that with an earthquake, tsunami, and total lost of power to control the reactor that nothing more devastating happened. Osama binLaden: Nearly ten years after 9/11 America finally had its revenge on binLaden and his death was a cause to celebrate. I did not dance in the street at his demise, but felt a sense of accomplishment at the stellar work of our military and Intelligence folks tracking him down and killing him. I am glad that there will be no trial. Boeing Blackmail: A sad story that had a somewhat happy ending as Obama’s union-controlled NLRB held up Boeing’s plans to open a new plant in right-to-work South Carolina which irked unions everywhere. Fortunately the Republicans were holding up Obama’s proposed appointments to the NLRB and kept Congress “in session” so he could not make recess appointments. With the clock (year) running out and their recess terms expiring the NLRB cut a deal that didn’t hurt Boeing too much. The Left’s (Obama’s) war on energy: There is not a war on all energy, just those sources (coal, gas, and nuclear) that provide MOST of the energy in the United States. Defenders of the offensive tout the number of lives that will be saved, but ignore the number lost due to much much higher energy bills that they will no longer be able to afford. 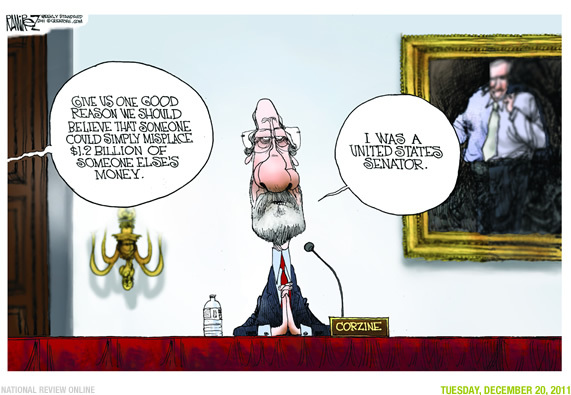 Democrat John Corzine and MF Global: Corzine, recently touted as Obama’s pick to replace Treasury’s Geithner, is mired in a scandal at the bankruptcy of MF Global where he was CEO. This one should make Enron look tame if it got any press. No Budget: We are fast approaching 1000 days since Congress has last met its obligations and have passed a budget. There have been far too many continuing resolutions for my taste. Occupy This: The Whine About This (or Occupy) movement was the most covered non-story of the year. 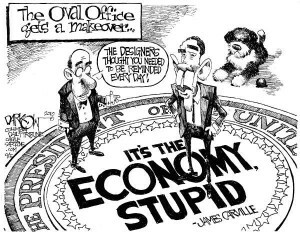 Like homeless people during a Democrat administration they will just fade away from the front page because they have become unruly, unpopular and are now a drag on Democrats like Obama who supported their movement. Neo-Liberals (AKA progressives, socialists, communists) just don’t understand that America hasn’t quite lapsed into the brain-dead zombies they think we are…YET! Other notable stories…The death of Steve Jobs, Obama’s gazillionth vacation/round of golf, and my favorite Obama’s Battle with Fox News. This article was published on Dec 29, 2011 . It is tagged bin laden, boeing, budget, coal, congress, corzine, death, democrats, earthquake, economy, energy, eric holder, fast and furious, fisker, green, japan, justice department, lightsquared, mf global, news stories, nlrb, nuclear, obama, republicans, solyndra, top ten, tragic, tsunami, unemployment, weapons, wind capital. You can follow any responses to this article through the comment RSS feed.